WASHINGTON – As the Interior Department prepares to release new federal fracking regulations, a sportsmen’s coalition is urging officials to make sure the rules will adequately protect air and water quality, fish and wildlife. The update to oil and gas drilling methods on federal and tribal lands is the first in about 30 years, Sportsmen for Responsible Energy Development noted Tuesday. Meanwhile, the process of hydraulic fracturing, or “fracking,” has significantly changed, opening previously inaccessible land to development. The National Wildlife Federation, Trout Unlimited and the Theodore Roosevelt Conservation Partnership are the lead partners in the SFRED coalition. SFRED supports requiring companies to disclose the chemicals in fracking fluids both before and after drilling so that appropriate steps can be taken to safeguard natural resources. Hunters and anglers urge the Interior Department to retain provisions in an earlier draft of the rules that address well-casing integrity and fracking fluid waste. The fluids must be properly contained and water quality must be monitored, coalition members said. The U.S. House Natural Resources Committee plans a hearing Wednesday on the federal fracking rule. Hunters and anglers encourage committee members to implement federal oil and gas regulations that match the industry’s 21st century technology. SFRED members also stressed that the Bureau of Land Management must not abdicate its responsibility for managing federal lands to the states as some in Congress have suggested. “A responsible Federal policy is needed to set a baseline that all States must meet on Federal lands,’’ SFRED said in written testimony submitted to the Natural Resources Committee. SFRED understands that energy is vital to our economy and way of life and that decreasing our reliance on foreign sources is important. Sportsmen for Responsible Energy Development is a coalition of more than 500 businesses, organizations and individuals dedicated to conserving irreplaceable habitats so future generations can hunt and fish on public lands. The coalition is led by Trout Unlimited, the Theodore Roosevelt Conservation Partnership and the National Wildlife Federation. DENVER – A sportsmen’s coalition applauds the Bureau of Land of Management’s balanced decision on the protection of many vital fish and wildlife habitats, but has concerns about the increased risk to the greater sage-grouse. The final programmatic environmental impact statement released Friday would make about 800,000 acres available for oil shale and tar sands production in northwest Colorado, southwest Wyoming and northeastern Utah. Sportsmen for Responsible Energy Development supports the BLM’s move to require more research before issuing commercial leases on public land and believes it is prudent for companies with existing research parcels to show tangible results before additional land is leased. While many important habitat areas were protected, some key greater sage-grouse habitats in Wyoming were opened to potential development, which is of concern, the coalition said. The National Wildlife Federation, Trout Unlimited and the Theodore Roosevelt Conservation Partnerships are the SFRED coalition’s lead partners. The proposal revises a 2008 plan to open about 2 million acres of public lands in the three Rocky Mountain states to oil shale and tar sands development. The BLM took another look at the plan after challenges from several conservation groups. 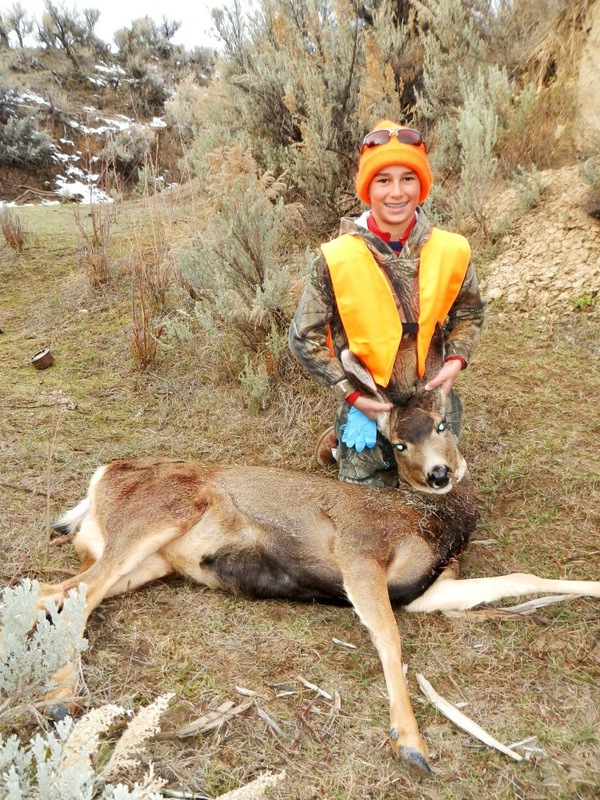 Northwestern Colorado was home to about 120,000 mule deer in the early 1980s, O’Neill said, but the population had dropped to about 50,000 by 2010. Hunters and anglers commend the Interior Department for taking a more prudent approach to oil shale and tar sands development, said Ed Arnett, director of the Theodore Roosevelt Conservation Partnership’s Center for Responsible Energy Development. “The region’s fish and wildlife populations are dependent on the availability of clean, cold water. Our water supplies in the West are too valuable to put at risk until the technology is better developed,” Powell said. DENVER – The Bureau of Land Management has considered the list of Colorado candidates for leasing reforms that take a landscape-scale look at conservation of public lands, and the result is no good news for fish, wildlife and sportsmen. Sportsmen for Responsible Energy Development said Thursday that the BLM’s decision not to approve a master leasing plan for South Park, a premier fish and wildlife haven in central Colorado, is the latest case of the agency’s failure to follow through on the promised reforms a year after identifying sites that merit MLPs. None has been approved in Colorado and little progress has been made in other Western states. South Park, prized by sportsmen for its world-class fisheries and pronghorn, mule deer and elk herds, is a prime candidate for an MLP, which would identify important conservation values and potential cumulative impacts early in the energy development process, SFRED said. The sportsmen’s coalition is led by Trout Unlimited, the Theodore Roosevelt Conservation Partnership and the National Wildlife Federation. The BLM describes a master leasing plan as a way “to restore needed balance to the development process by improving protections for land, water and wildlife” and to address potential conflicts. An MLP would provide a crucial step between the more general, overarching resource management plan and approvals for specific leases and drilling permits, when there’s limited opportunity for analysis of the potential, cumulative impacts, said Suzanne O’Neill, executive director of the Colorado Wildlife Federation, which formally proposed South Park for an MLP. About 450 people and businesses, many of them from the South Park area, signed a petition asking the BLM to approve an MLP to conserve one of the “last wild places” while allowing energy development. “So, it would appear that we are too late for North Park and too early for South Park,” SFRED wrote in a Feb. 1 letter to BLM Director Bob Abbey. The lack of final guidance for the development of MLPs has created confusion within the agency and among the public about where and when the plans should be used, according to SFRED. North Park contains the headwaters of the North Platte River and is home to moose, elk, bear, pronghorn, mule deer and the greater sage-grouse, which is a candidate for listing under the Endangered Species Act. Both North Park and South Park already have oil and gas wells and sit atop the oil-rich Niobrara formation, seen as possibly the nation’s next big play. Meulengracht challenged the BLM’s reasoning that at roughly 50 percent, too much of North Park is already leased to preclude preparation of an MLP. DENVER – The Bureau of Land Management’s proposed rules on public disclosure of the contents of hydraulic fracturing fluids, as well as the handling of wastewater and the integrity of well casings, represent a step forward in ensuring responsible energy development on public lands, a sportsmen’s coalition said Monday. Sportsmen for Responsible Energy Development has called on the BLM to make sure resources such as water, fish and wildlife are conserved when oil and gas are developed on public lands. The draft rule on hydraulic fracturing, or “fracking,” is a prudent response to concerns about the potential impacts of drilling and the handling of drilling fluids on the lands that are crucial to the West’s water supplies, fish and wildlife, said Brad Powell, energy director for Trout Unlimited’s Sportsmen’s Conservation Project. TU is a member of the SFRED coalition. The proposed federal rule would require public disclosure of the chemicals in fracking fluids before and during drilling. Companies stating that the fracking mixtures are proprietary would have to explain why the information should be kept from the public. The proposal also addresses testing to ensure the integrity of well casings, pipes placed down a borehole and held in place by cement to keep the oil and gas from mingling with anything else. The document includes rules for safely storing and disposing of waste from recovered fluids. Some states, including Wyoming and Colorado, have approved regulations requiring disclosure of fracking fluids’ contents as increased drilling has raised concerns about the chemicals used.